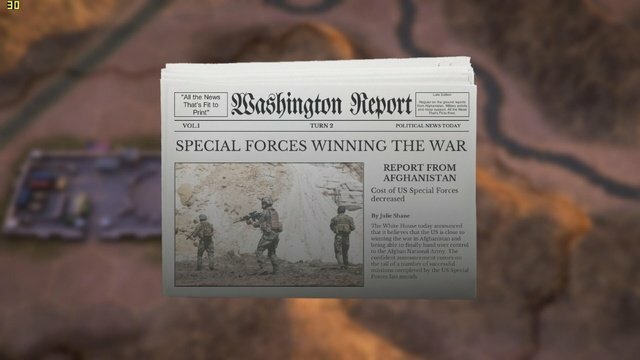 I suppose it had to come to this, perhaps the intersection of absurdity and unreality expressed through a video game as the only true way to capture the essence of America’s 15 year+ was in Afghanistan. I must stress this is a real game. It is not satire or a joke. The game plays you in the role of supreme commander of everything U.S. in Afghanistan and requires you to democratize the country. You do this by bombing the sh*t out of stuff, meeting with elders, pulling out “intelligence” and reconstruction cards, and accomplishing tasks like bringing fresh water to some village to pull it away from Taliban control. There are also drones you control, lots of drones. Winning is determined by collecting Hearts and Minds Points as determined by the computer based on your actions. The same company makes, and I swear to God this is true, a Vietnam War version of the game that works much the same way. Here’s a video of some Douchey McDouche playing the game. Be sure to fast forward to 7:10 , where he blows away his first Taliban for freedom. He should sit at a desk at Creech. Then he should walk without water for months in Death Valley. Is there a premature withdrawal (N0W) opt-0ut !? Its just another training simulation…..
Just like ‘Call of Duty’ and all the other crap video games kid play now…..
Can’t spell their names effectively….. But they sure as hell are being trained to be damn fine, un-feeling Killers.